My aunt Sally* was a generous and frequent gift giver. No one could visit her house without these three things—a good meal, lots of games, and returning home with a few gifts from Aunt Sally. As a small girl, she would always bring presents for all, young and old, adults and kids. Sometimes I would try to mask my disappointment when the anticipated gifts didn’t match my expectations. I was kid, after all, but even when disappointed, I still knew those gifts came straight from her bottomless heart, and I loved her all the more for her thoughtfulness. Aunt Sally was a teacher. Aunt Sally was a kisser. Aunt Sally was a shopper. Aunt Sally was also a hoarder. When she died suddenly last November, one of the most overwhelming tasks facing her children and my mother was sifting through all of her stuff. Drawers full of stuff. Boxes bulging with stuff. Closets overflowing with stuff. Rooms piled with stuff. Mom spent hours at Sally’s house, sorting between trash and treasure, sometimes accompanied by one of her siblings, sometimes with Sally’s two children. Family history was carefully packed away, family heirlooms were thoughtfully divided, and trash got hauled to the curb. Despite all of their efforts, stuff still remained. In tribute to Sally’s generous heart and after removing their sentimental items, Sally’s kids opened her house to all of her nieces and nephews after the funeral, granting permission for the not-so-close-but-still-beloved family members to select our mementos from Sally’s life. I knew exactly what I wanted, and I knew it would be nearly impossible to find in the chaos. 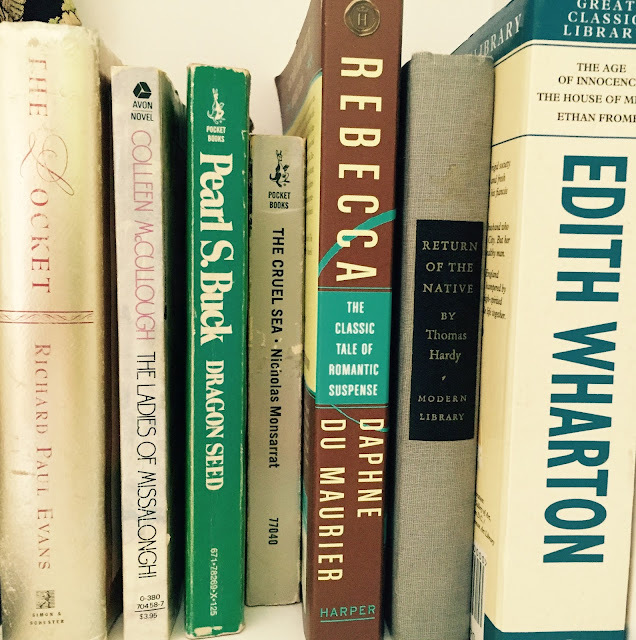 Sally and I spent hours discussing literature, and she always recommended her favorites to me. When we visited her in California just after we got married, Aunt Sally recommended one of her all-time favorites, The Ladies of Missalonghi, and I checked it out of the library when I got home. While I never loved the book, I loved the lady who suggested it to me. And I wanted her copy of her favorite book to remember her. Bookshelves in almost every room made my search difficult, and with the house swarming with people searching for their own treasures, the shelves were disheveled and disorganized. I picked through each shelf in each room, moving systematically from room to room and floor to floor, and I couldn’t find that book—a small, nondescript $3.95 paperback book that held many memories for me. As I glanced around the family room, something underneath a pile of bedding covering a small yellow chest caught my eye. I knew that piece of fabric well, and unexpected tears stung my eyes. I hurried across the room, unceremoniously removed the quilts and sheets, and lovingly unfolded the faded, velvety tapestry with the fraying edges. No one else wanted this? No one else valued this? How had it avoided the onslaught of searching and claiming--and how was it still there? After lovingly refolding the neglected scrap and tucking it under my arm, I raced up the stairs to find my mom. Surely she would appreciate the treasure I’d uncovered. Mom was busy, managing the rummage sale atmosphere in the house. Everyone came to ask her questions. “Is it ok if I take _______________?” or “Has anyone seen ________________?” She kindly answered each question as she pulled ring after ring out of a box for each of the nieces to examine and choose. “MOM!” Even though she was busy, she turned to me, sensing something in my voice. “Is it ok if I take this?” And I carefully unfolded the 24x40” memory. As her eyes met mine, tears and memories flowed between us. 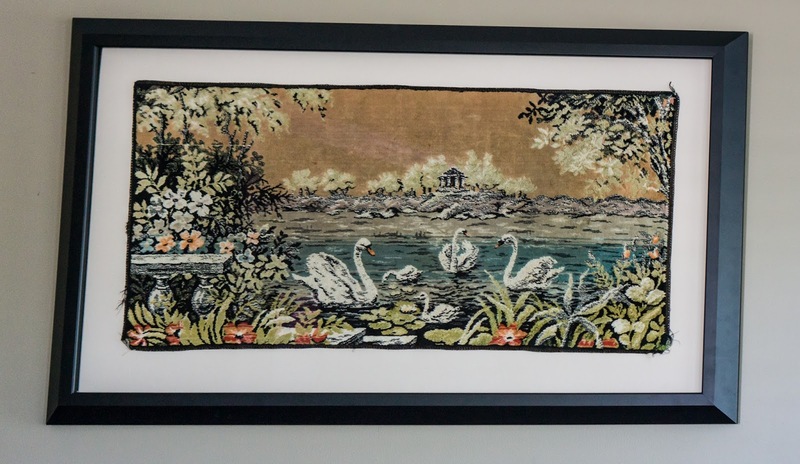 Swans glide across the tapestry—the scrap of fabric that protected the slick surface of my grandparents’ piano bench. Stroking it took me back many years, and I was a tiny girl again, learning to play the piano. I can’t calculate how many times I sat on that tapestry, begged by my grandpa to play for yet another guest to their home. No matter how many times I’d plink those keys, my grandpa would stop to listen and praise. My grandpa was a music teacher who loved all kinds of music, and I loved playing for him. Over the years, my piano pieces got longer and his praise more sincere as he sat in his scratchy green rocker/recliner and to listen. Funny how memories get triggered like that. I could see my grandparents' love for me mirrored in my mother's face, and I hugged her tight. "Oh, Jen. You should have that. Please take it." And we cried some more, words no longer necessary. Afraid to put it down for fear someone else would recognize its value, I carried the tapestry over my arm as the chaos around me dissipated. Boxes of books were loaded into trunks. Quilts and crocheted afghans draped people's arms. Little gems and bigger trinkets slowly disappeared from view, headed to homes where they will be used and loved. When we got home from the funeral, I placed the tapestry in a plastic bag and left it on my hobby room desk. 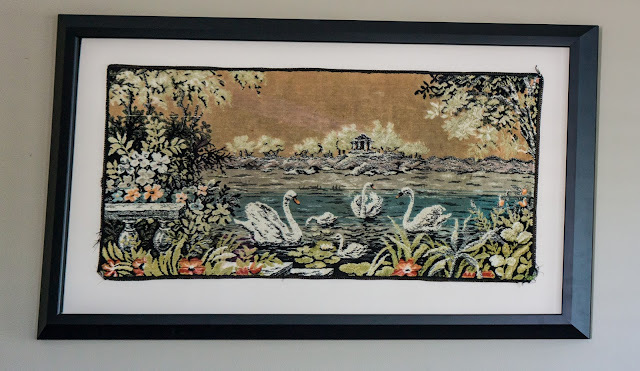 While not necessarily forgotten, the swan tapestry did get buried beneath Christmas wrappings, school books, and needles and thread for prom dress alterations. When I cleared the desk off a few weeks ago, I rediscovered my treasure. What to do with it? It wouldn't work as a covering on my lumpy adjustable piano bench, and its value to me belies its appearance. This week I picked it up from the framer's, and it now hangs in my living room, across from my piano. Just a few feet away on a quiet shelf in my library is a small $3.95 paperback book that also found me at Sally's house. Gifts to me straight from heaven itself. *You can read a little about Aunt Sally here. You have the gift of knowing the value of these things. 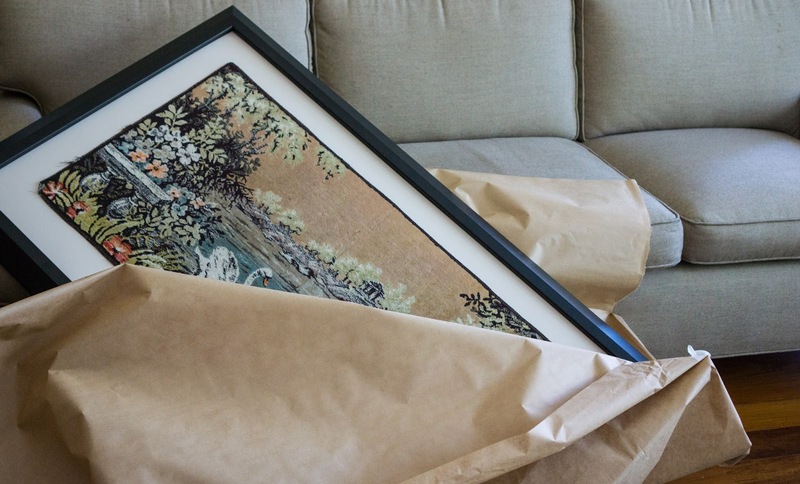 I love that you framed the piece of tapestry. That tapestry is a treasure, and it looks wonderful, too. Beautiful! Made me teary today - in a good way.